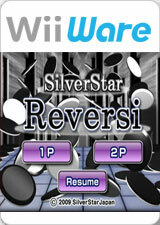 Silver Star Reversi has 2 modes - 1-Player and 2-Player. 1-Player mode allows you to play a match against the computer opponent. 2-Player mode allows you to play against another person. In 1-Player mode, you can select amongst 5 different computer opponents, as well as turn the background music off, adjust sound effects, and access in-game help features. Also, during the match, you can redo your last move, save the game at any point, or resign from the game. After the match has ended, you can review each move made during the match. While reviewing the match like this, you can resume that match at any point. The graph below charts the compatibility with Silver Star Reversi since Dolphin's 2.0 release, listing revisions only where a compatibility change occurred. This page was last edited on 15 January 2018, at 05:03.